With the weekend in Cincinnati over, it was time to return to Cleveland. I had two days before my flight back to New York, and needed to find a couple of games in the area with the Indians out of town. 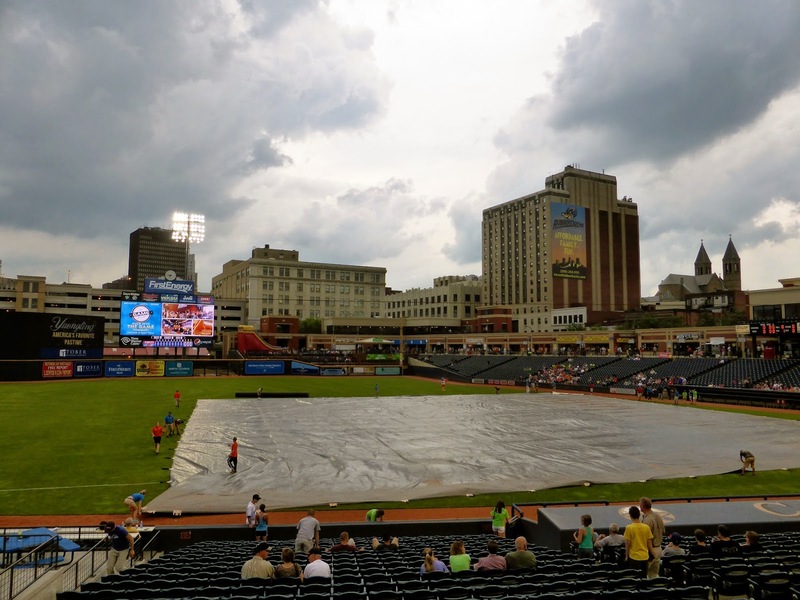 Both the Akron RubberDucks of the Eastern League and the Mahoning Valley Scrappers of the NY-Penn League are close enough, and the schedule worked out, with Akron home both nights while the Scrappers opened a series on Tuesday. On Monday, I drove into Akron a few hours before game time, parking downtown and finding a local establishment across from Canal Park to watch the late World Cup games. 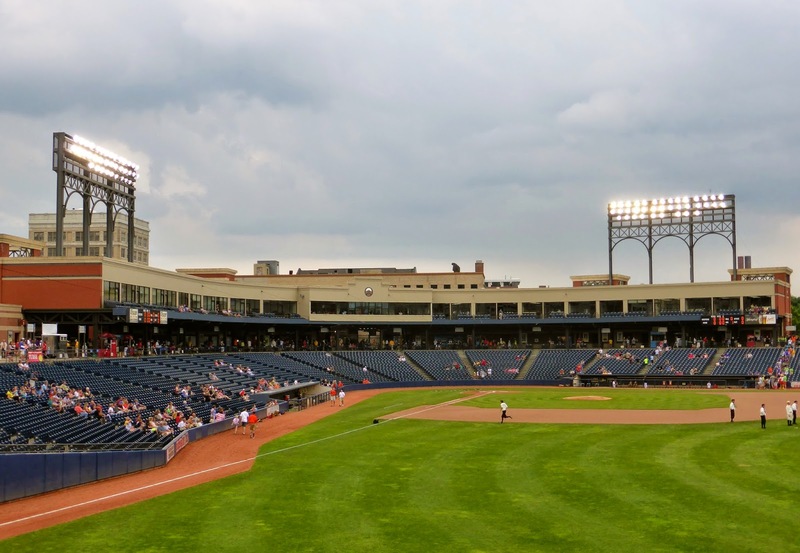 When those ended with Brazil and Mexico through to the next round, I crossed the street to the stadium, where I purchased a $9 ticket to sit in the second row behind the dugout as the RubberDucks got ready to host the Erie SeaWolves. AA ball is perhaps the best value out there, often with more true prospects than AAA, and Akron is no different, with two of the Indians top 5 prospects in Francisco Lindor (#1 in the system and #9 overall) and Tyler Naquin (#4). Erie is the affiliate of Detroit and boasts #2 Tiger prospect Devon Travis. This was not my first trip to Canal Park; I had visited here in 2008 when the team was still known as the Aeros, but left the game early due to a sudden illness with the visiting team up 9-3. Well, Akron came back to win 11-10 in ten innings in a game that lasted 4:17, so my visit was invalidated in terms of counting the venue. I wanted to make sure I didn't leave early this time, and of course, as soon as I walked in, the tarp was put on the field. 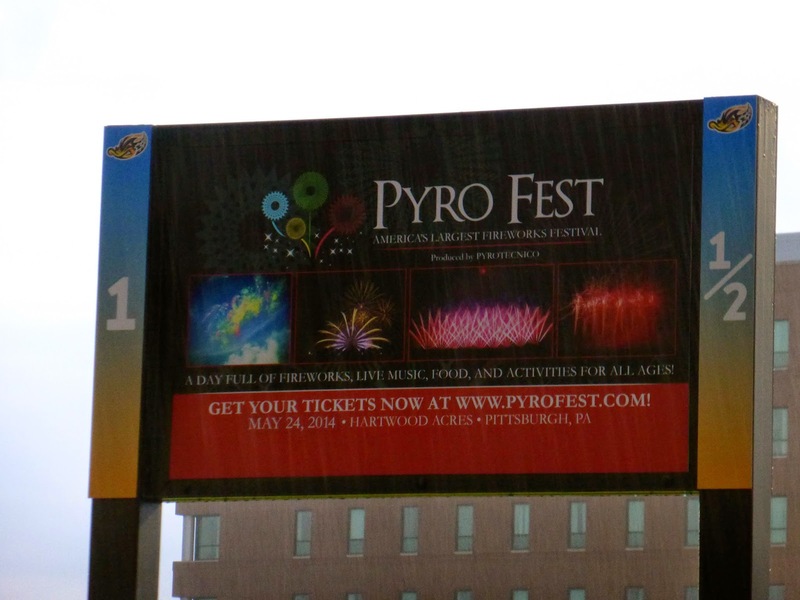 Shortly thereafter the rains opened up, but the crowd was told that it would eventually clear up. Which it did. Eventually. First pitch was at 9:36, about 2 1/2 hours after it was scheduled. 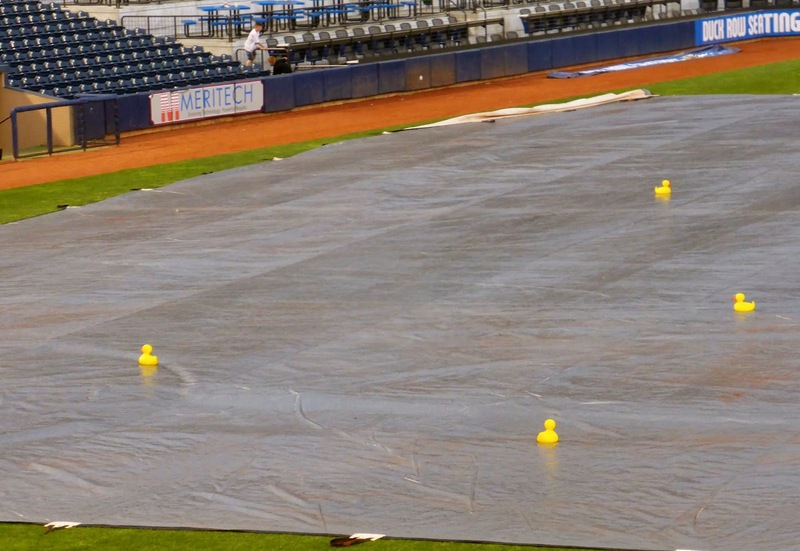 Fortunately, the RubberDucks rebranded during the offseason, going for the anthropomorphic moniker that appeals to children and allows for more interesting promotions, including allowing rubber duckies to swim on the tarp (below), playing the Rubber Ducky song during the long delay, and relying on puns such as Quakron. The Rubber part of the name is no accident as Akron is known as the birthplace of tire and rubber companies such as Goodyear and Firestone. Brilliantly done although the team did receive a lot of national ridicule when the name was first announced. It works well though and attendance has grown after stagnating under previous ownership. 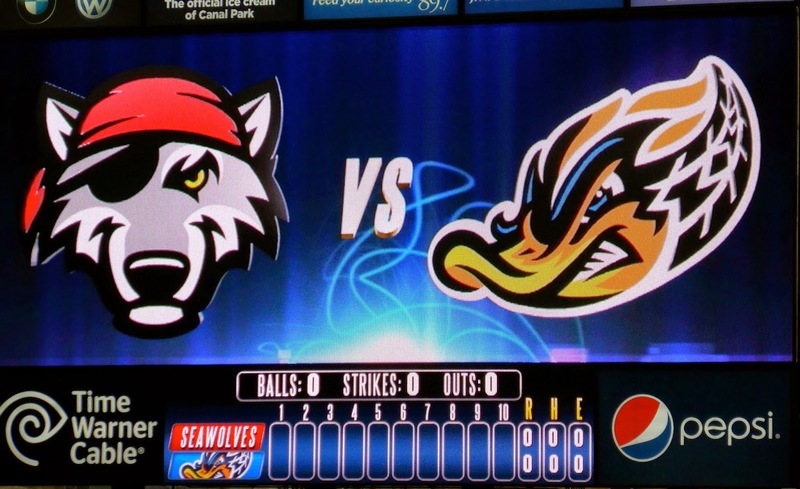 The thoughtfulness towards fans was displayed during the rain delay as Game 1 of the College World Series game was shown on the scoreboard for a while, and other promotions were held on the concourse and field to keep fans entertained. When the game got underway, both pitchers showed no ill effects from the delay, until the bottom of the third. After Jake Lowery (4th round, 2011) doubled to lead off, starter Tommy Collier (22nd, 2011) walked Jordan Smith (9th, 2011). A balk moved them to second and third, and then Naquin (15th overall, 2012) singled home Lowery and Lindor (NDFA, 2006) followed with another single to make it 2-0. 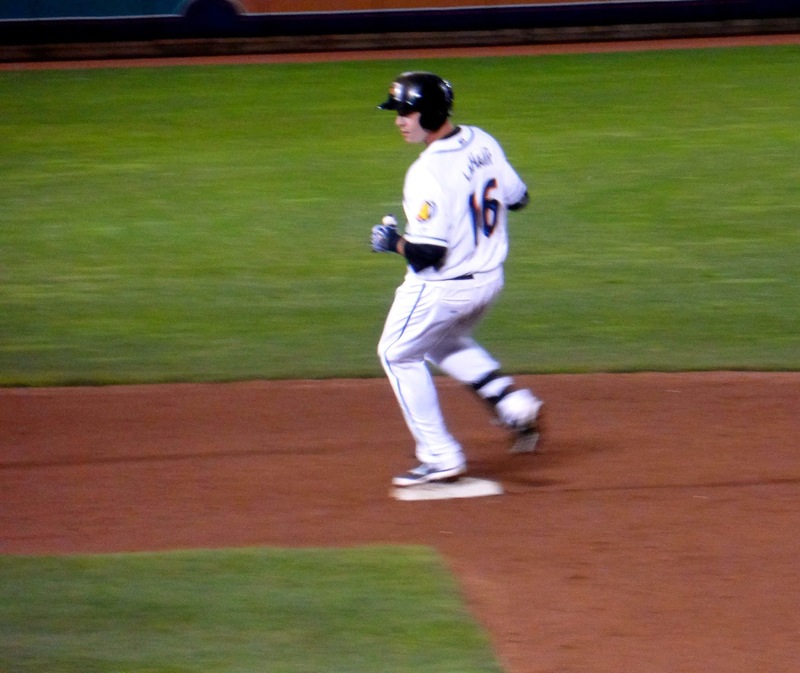 Joe Wendle (6th, 2012) walked and the Bryan LaHair, who was an MLB all-star with the Cubs in 2012 and spent 2013 with Fukuoka in Japan, cleared the bases with a double (below). LaHair is struggling to get back to the majors, having been sent down from Columbus after just 10 games. 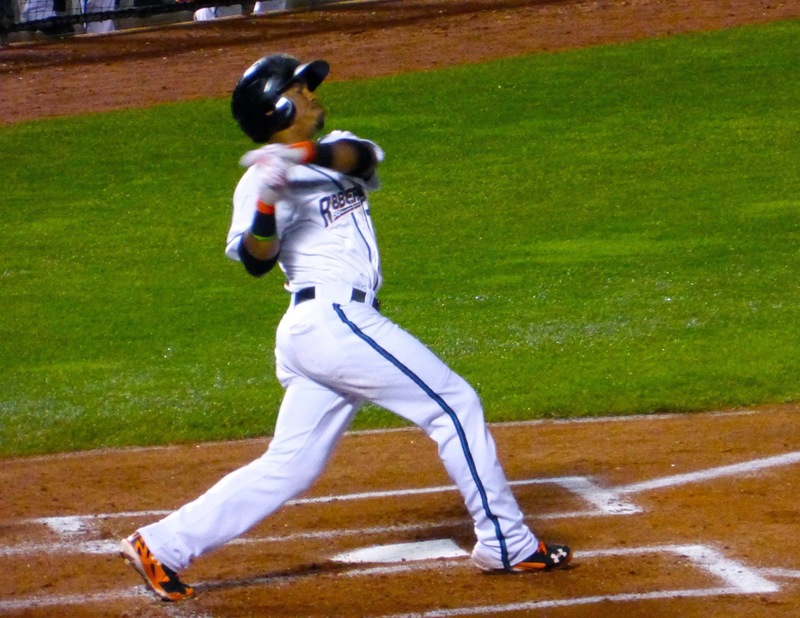 Lindor (below, having lost his bat) added a monster solo home run in the fifth to make it 6-0, more than enough for Joseph Colon (12th, 2009) who gave up just one run through seven innings as Akron cruised to a 7-1 win. The game finished at 12:15 just as the rains returned, making for a wet walk back to the car. It was Doppelgänger night and each RubberDuck was paired with a celebrity lookalike on the scoreboard. 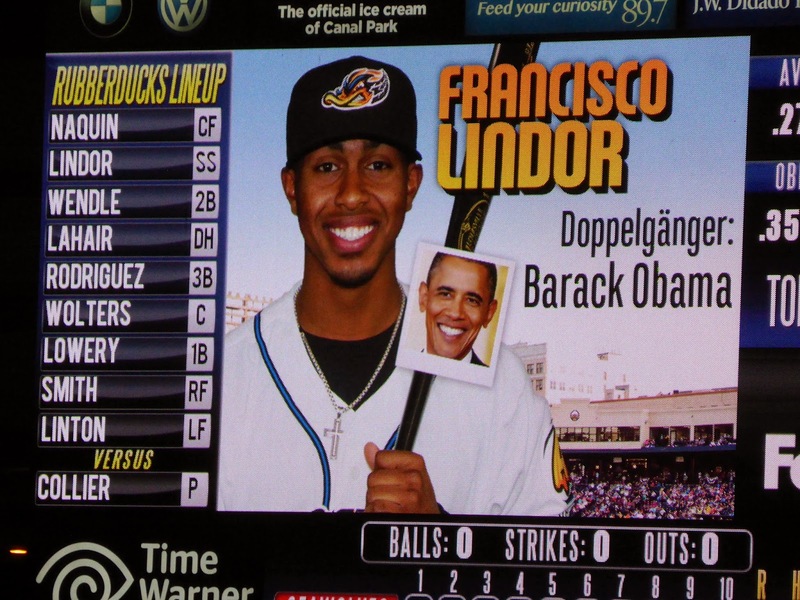 Lindor resembles Barack Obama. Tuesday had rain in the forecast, so I skipped Mahoning Valley, which was about 40 miles away, and returned to Akron, where I watched Japan lose to Colombia and Greece advance over Cote d'Ivoire at the same bar. When those games ended at 6, the sun was shining, so I bought a $5 GA ticket to sit in section 1/2 (below), but they announced just before 7 that a front was moving in and by 8:15, the game was postponed. So if you need a free ticket to a game in Akron this season, just let me know. The game in Mahoning Valley was also postponed. The trip wasn't entirely in vain as I did briefly see the Greater Akron Baseball Hall of Fame which has a separate entrance next to one of the main gates. It is still being put together and would take only a few minutes to check out, but it is nice to see another baseball attraction being added to a top minor league park in a city that is known mostly for basketball these days.